It's plum season! And so I decided to make a batch of plum ice cream. 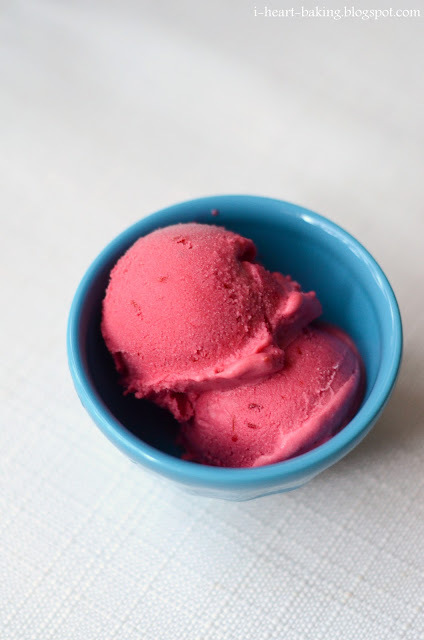 I found the pefect recipe in my favorite ice cream book, David Lebovitz's "The Perfect Scoop". After cutting my plums into wedges, I cooked the down with a bit of water, before adding sugar and pureeing them with heavy cream. Then I let it chill in the fridge for a few hours, before churning the mixture in my ice cream maker for about 25-30 minutes. When it was done, I poured the semi-frozen mixture into a container to let it set in the freezer overnight. And the next day, it was ready! The ice cream turned out delicious! It was refreshing, tangy, and sweet all at the same time, and reminded me of chinese preserved plums (li hing mui). And I loved the color that it turned out! @Elizabeth King - thank you! Based on your delicious fresh plum ice cream photos, we'd like to invite you to submit your food photos on a food photography site called http://www.foodporn.net so our readers can enjoy your creations. Just to say hello. And I always love your photos! I want to buy an ice-cream maker, can you recommend one? Thanks!